Denny Jump (Bellevue, WA, United States) on 26 August 2018 in Animal & Insect. 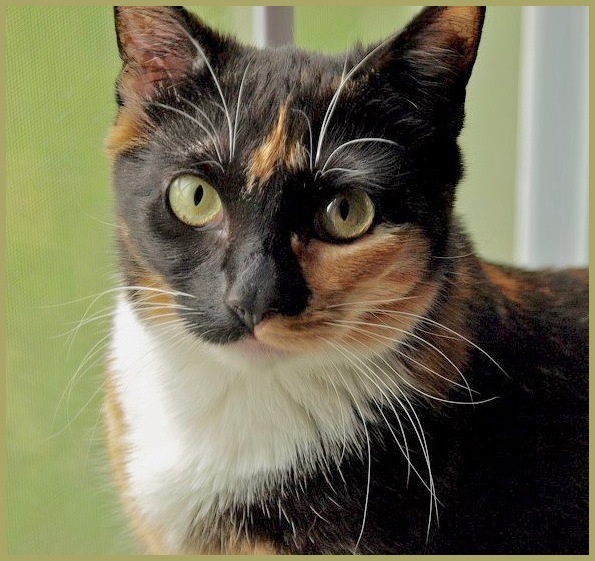 On Friday August 24 (yesterday, as I write this) our beloved 9 year old Calico cat, "Cali" succumbed to a very aggressive case of cancer that rapidly affected her internal system! We noticed things early in the week and took her to the doctor right away, but, as fast as we reacted, the cancer was even faster, and by early Friday, we were faced with the harsh fact that we would have to say goodbye to this cute little girl who was the light of our life! I will return to the current series of the State Capital in Olympia, Washington in a few days. Until then, Thank you for your understanding and support. Sad to read. I know all too well the emptiness brought on by the loss of a cat . . It takes time to come to terms but they are never forgotten. @Ronnie 2¢: Thank you,Ronnie...your words are so very much appreciated and so true. Mornings have been tough, but as the sing goes, "It’s Getting Better..."
I discover this sad news tonight and wanted to tell you I think of you. And I also thought of you when hearing of the death of John McCain who fought in Vietnam and dared saying what he thinks about you-know-who. It's so sad and brutally hard to lose such wonderful companions. Best wishes to you and Barbara. @Steve Rice: Thank you, Steve. It has been especially difficult... We have lost pets before but this came-on so suddenly, we were caught unaware....but slowly we are getting better...Sometimes things just don't seem fair, do they? Thank you so much!. Very sad news. I hope you an Barbara are holding up well. We had a couple of budgies die on us previously and even though they were with us a lot shorter, it was still hard to take in. I think it's always best to look back upon the happy times you had with Cali and the happiness that she brought into your lives. @Darkelf Photography: Thank you for your very kind sentiment, Maciek. I agree with you...to remember the good - times with pets that have passed on - brings a tear but also a smile...Bless you both! It is so sad to lose a beloved pet. Kitties are such companiable and non-demanding friends. Who could resist those gorgeous eyes. I am so sorry you lost your little one. Pets have a way of attaching themselves to our hearts. Cali is beautiful.